Built in 1783, our building was once a city office and school. 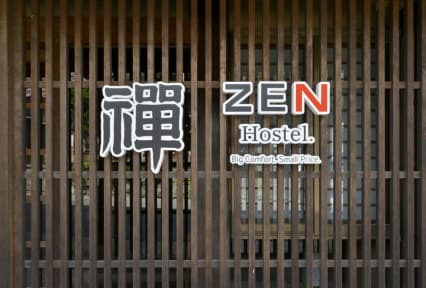 It was then a traditional Japanese Hotel for 120 years before becoming ZEN Hostel, where modern meets traditional. Our facility boasts a lounge with a view of the in-house pond, clean, comfortable & spacious rooms, a small gym area and a cafe/bar where locals and guests can create new but lasting friendships. ZEN Hostel also has events such as making paper crafts with a local artist, language exchange, tea ceremony, & yoga. Outside of the hostel, you will find several hot springs, cute shops, restaurants and a shrine. There is also a nice walk around the town which encompasses 3 Deities of Happiness or hiking and cycling trails at Shiga Kogen. Lovely place with lovely staff, as close to the monkeys as you are going to get. The staff were very accommodating and very kind. I really enjoyed my stay in Zen. I should be satying there again when I will visit Nagano. I really enjoyed this hostel. Most people come for the snow monkeys, but we came because we were looking for some down time after some mad travels. Really nice area, gorgeous walks, snow monkeys are great and the hostel itself is great. Not the most comfortable beds, but not the worst I've had. Super clean and affordable! Very caring and friendly staff, available for help if needed. Close to the train station. We really enjoyed our stay! Helpful staff! Bomb curry!! Good atmosphere and comfortable rooms. The bathrooms were small but very well kept. Overall a cozy and friendly atmosphere. I would return. Very good service and a really cool building. Stayed in a private room and it had a code locking system, great heating in the room. Common areas were a bit cold but the views are stunning. Easy access to Yudanaka station and busses going to the snow monkey park. Close to convenience store and a host of bars and restaurants. Staff are extremely helpful and kind and cater to English speakers well. The hostel was located in a rather small town with literally a few streets and the nearest market was an hour away, but there is a Lawson (convenience store) 2 min walking distance. I stayed in a 16bd mix dorm and the beds were hard, so I found that rather uncomfortable, but there are extra comforters available for extra cushion. Great location! But very very quiet. I think we were the only ones in the building most of the time (not even staff). Kind of expensive for what it is. Staff spoke great English when they were there. There were a group of marathon runners staying in the mixed dorm room who were very disruptive and should have been allocated their own room, as they were up before 4am and making lots of noise and light. I have already emailed the hostel suggesting there should be a policy about large disruptive sports groups staying in dorm rooms. Also, there are no female toilets on the dorm room level. No power outlets that I could find in the rooms, and the room temperature was very cold. Good location.